Google Experimental Offers Vote Up Search Listing: End of SEO? Home > Google News > Google Experimental Offers Vote Up Search Listing: End of SEO? Yesterday I covered the news at Search Engine Land of a new Google experimental search feature that lets you move search results up and remove results from the Google search results page. The changes you make only impact you - your login and does not influence the overall scope of the search results. But can they? Who knows. We have been seeing Google test remove results features before and then drop the feature. This experiment lets you influence your search experience by adding, moving, and removing search results. When you search for the same keywords again, you'll continue to see those changes. If you later want to revert your changes, you can undo any modifications you've made. Note that this is an experimental feature and may be available for only a few weeks. A Cre8asite Forums thread is talking about how this may or may not impact SEOs. Well, this is nothing new. We have had whole conference panels on the topic, such as Personalized Search: Fear or Not?. Plus we have shown how much the personalized results today can differ from non-personalized results. In fact, why not try turning off Google personalized results yourself and do some tests. Is this new Google experimental test the end of SEO? Not at all. 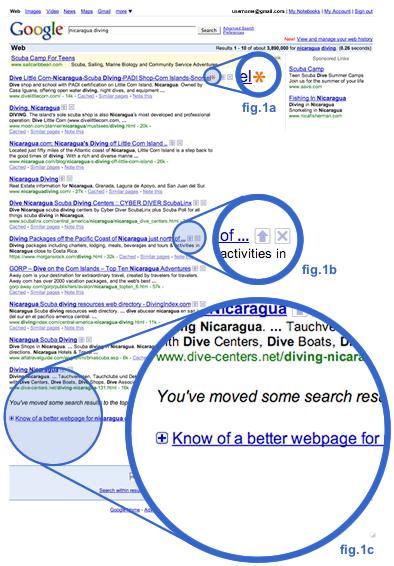 This does not add much more than what we have today with Google Personalized results. All it does it make it more visible to all of us.